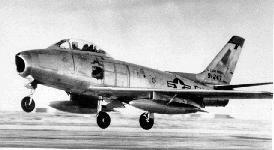 Five F-86F aircraft took off from Dow AFB for a local air combat training mission. Near Millinocket, Lt. Alfred Lang and his wingman were "bounced" by the other three aircraft and a jet dogfight began. A new Second Lieutenant to the squadron got an advantage on Lang and he was having difficulty shaking him. He performed a double immelman and experienced a stick "freeze" when he tried to roll out at the top at about 20,000 feet. The aircraft stayed in a nose high attitude bleeding off speed quickly. At 20 knots, the aircraft stalled and entered a tight spin from which Lang was unable to recover. At 10,000 feet, he ejected landing in a tree near an old woods road. He walked to a nearby occupied camp and was picked up later in the day. 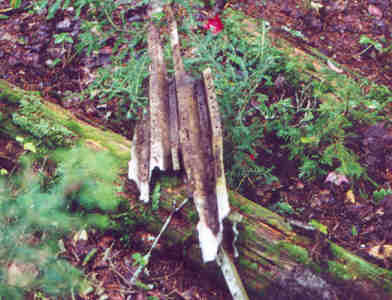 The aircraft "pancaked" into a thick snow filled swamp and burned. 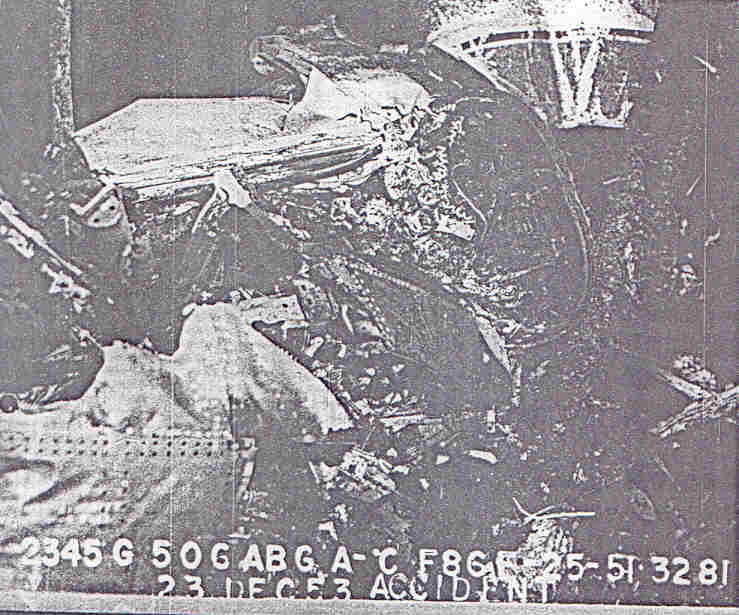 The inquiry concluded that icing on the stick linkage, below the cockpit floor, a problem experienced with other "F" model F-86s, was the cause of the accident. Squadron mates are reported to have frequently "ribbed" Lang about intentionally stalling the aircraft because he couldn't shake the green Second Lieutenant, and wasn't going to let himself get "waxed"! Lt. Lang was a Korean War veteran and went on to make a Mig 21 kill in Vietnam with a sparrow shot from an F-4 Phantom. Lang died of a heart attack while still on active USAF duty at Air Defense Command HQ. 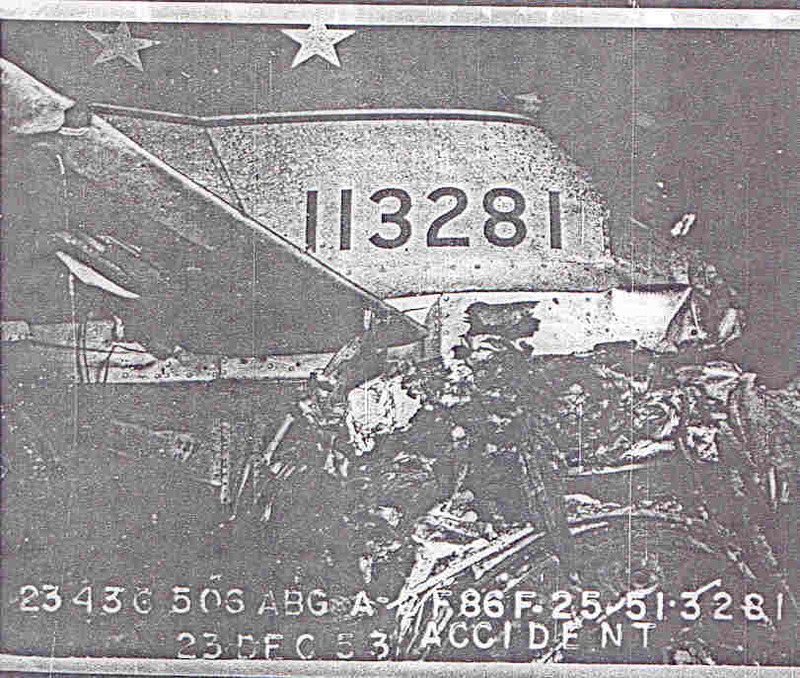 USAF Crash Report photos show the tail section (left) and cockpit area (right) with post crash fire damage. This crash site, a few miles from my home, is a good example of how not to preserve a historic crash site. 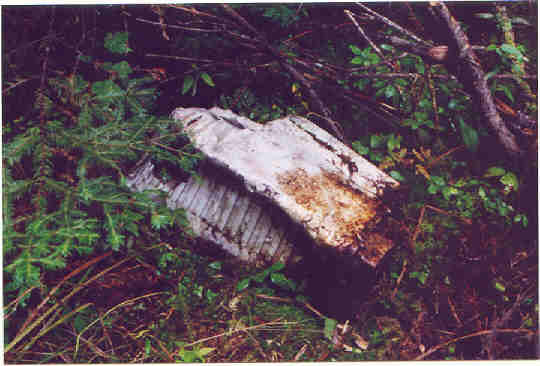 The major preserved sections of the wreckage were hauled off by a woods contractor operating nearby and sold for scrap in the 1990's. 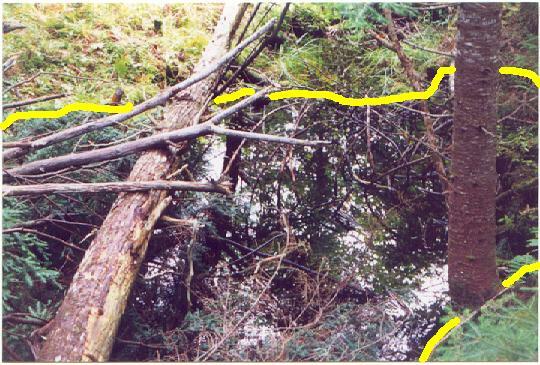 Heavy equipment was used inside a stream buffer to recover the wreck. Fortunately, this site was not a fatality. The impact crater, highlighted in yellow. The plane struck in a flat spin on frozen snow covered ground. A 50 mm lense is just too much for wreckchasing in a Maine cedar swamp! 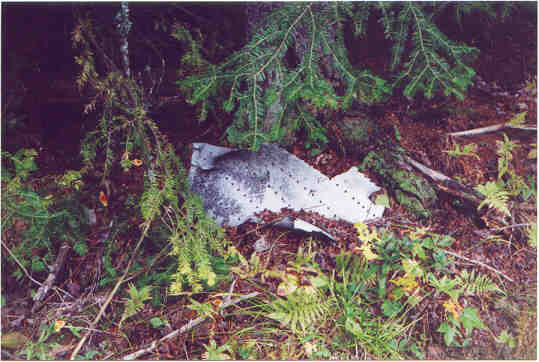 This section of fuselage skin, torn from its rivets by the impact, is typical of what's left at this site. The transmitter for the AN/APG-30 radar gunsite.